Cart recovery emails are a powerful tool for converting. Make sure yours are having the maximum possible impact. If you run an online store, you already know that cart abandonment is one of the biggest conversion killers; causing millions in lost revenue worlwide due to the many reasons for retail basket abandonment. And the chances are high that you must be sending a cart recovery email campaign to recover this lost revenue. But sending a cart recovery mailer doesn't guarantee conversion. You need to execute your cart recovery email program the right way to convince the lost shoppers to come back and complete their purchase. A successful recovery campaign is optimized for everything from design to copy, send time and the right sequence. And, if you are not taking all of these things into consideration you will not get the results that you are hoping for from these email campaigns. Here're five such mistakes that are costing you conversions and also how to eliminate them to see revenue lift and earn the trust of your customers. You’ve spent weeks to design a good cart recovery email campaign, days to craft a good email copy for maximum persuasion. But, it isn’t converting. There’s one crucial element you’ve overlooked. Timing. Timing is everything. The most finely crafted emails may not get opened when sent at the wrong time. For example, if someone searched for a Christmas gift on your site on 23rd December, added one in their shopping cart, and then abandoned it, there’s a good chance that they need it before Christmas. If you kept waiting for 24 hours to remind them that they’ve left their gift hanging around in your cart, chances are high that they will buy it from somewhere else before they receive your email. Sending cart retrieval messages to abandoners in real-time is crucial in recovering these lost sales. There is no ideal or best time to send a cart recovery email. It depends on a lot of the nature & ticket size of your product. For example, if you deal in products that require little research like grocery items, you can send the email within an hour after abandonment. But, if you deal in products like mobile phones, jewelry, etc. that typically requires more research than you can send it in the first 24 hours. The time window between once a shopper abandons your cart and receives your cart reminder email plays a critical role in recovering your cart. Too early and they will ignore it, but too much gap and they’ll forget about it or buy it from elsewhere. Constantly test and measure to find the ideal time gap. TIP: Don’t just determine when to send your email based on industry research (use the research as an inspiration to get started). Do test few send timings to find a sweet spot for your emails. By sending more than one cart reminder, you increase your chances of getting noticed. However, just like any marketing program, taking a thoughtful approach to strategizing your cart abandonment campaign will significantly improve your conversion rate. Here's how to create a cart recovery email strategy that will increase your conversions. Also, remember to keep the tone of your cart recovery emails more customer-service oriented rather than doing the hard sell every time. Consider including a little soft-sell message like "Did you faced any issues while ordering?" "Can we be of any help", and few related product suggestions in your cart abandonment series to create a perfect cart recovery series. Not everyone abandons a cart to receive discount. So, when deciding your cart retrieval offer you should keep this thing in mind. The discounts can help nudge a price conscious shopper to make a purchase. But, if someone is doing his or her last minute festival shopping an express shipping offer can induce him or her to complete a purchase. 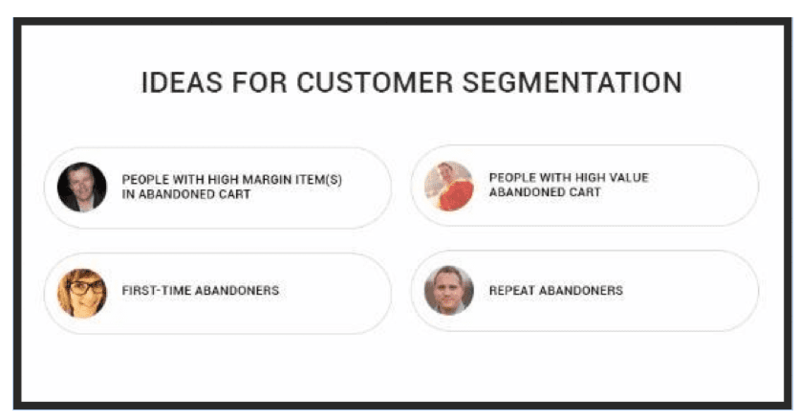 First, you need to segment your cart abandoners, so that you can identify them. For example, you can create a different segment for new subscribers who’ve abandoned the cart or loyal customers who’ve abandoned the cart. This will help you in deciding what to send in your email, rather than just blasting the same email to everyone. Cart mailers aren't promotional in nature; they're targeted to prospects who've expressed intent by adding items to their cart. But, there is a very fine line between reminding potential shoppers about the products they left in your cart and annoying them with your mailers until they start ignoring your emails. So, put a frequency cap in place to make sure that you don't keep on pestering them to come back and purchase every time they abandon their cart. Don't send a promotional email & a cart recovery email to a recipient on the same day. Also, set the maximum number of emails a cart abandoner can receive in a particular span of time to prevent subscribers from getting too many emails about the items they have abandoned. Use frequency capping to set daily, weekly or monthly limits on how often subscribers will receive an email from you. Setting a suppression window will help you to ensure that your customers aren't gaming your system to get discounts. There are a number of things which can decide the fate of your abandoned cart emails like email timing, offer, subject line, copy, CTA, personalization etc. ; each of these elements can have a great impact on your conversions. Keep A/B testing and analyze the correlation of your email response rates based on the performance metrics, such as opens, clicks, and conversions to make changes in your cart emails. Testing this way will help you optimize your cart recovery emails so that you can send the right message, at the right time, and the right sequence that will help you in converting more carts into orders. Split your email list into segments. Send 10% of the segment one email and the other 10% a different one. For example, if you are testing discounts offers then send 10% of the segment a message with an offer and the other 10% without an offer. Don’t stop by testing it just once. Test, test and test again before picking a winner. By stopping your tests too early, you decrease the chances of getting accurate results. Cart recovery emails are extremely effective in bringing back the lost shoppers to your site and recovering sales as long as you’re avoiding the five mistakes mentioned above. Thanks to Reshu Rathi for sharing their advice and opinions in this post. Reshu Rathi is Digital Marketing Manager at Betaout, a customer segmentation and marketing automation platform for e-commerce. Her job is to create content & marketing campaigns to help e-commerce marketers personalize their marketing & increase conversion. You can connect with her on LinkedIn.